Wales is a beautiful place. Rugged mountains and sea coast. Every bit as green as Ireland and even more sheep grazing beautiful pastures. The land area is roughly the size of New Jersey. The population is about the same as that of Arkansas. Of the 3 million people who live in Wales, about 800,000 claim some skill in the Welsh language. That figure is 27% of the 2011 population of Wales. The Celtic language of Wales is brittonic and is the only Celtic language that is not identified by UNESCO as "endangered". There are more active Celtic speakers in Wales than any other place in the world. Authoritative, written accounts of traditional Welsh music date back to 1194 CE. The author was Giraldus Cambrensis. He toured Wales in 1188 and identified the harp, crwth and pipes as the principle musical instruments of the region. Cambrensis’ 1194 book has one passage that has caused much debate among scholars. His writing indicates that harmony singing (polyphony is the technical term) was well established throughout Wales. Musicologists have long held that polyphony originated at Notre Dame Cathedral in Paris. Those Parisian compositions date no earlier than 1180 CE. At the very least polyphony, one of the most important developments in Western music, happened simultaneously in Wales and Paris. Perhaps it happened earlier in Wales. History reveals that the medieval musicians of Wales were every bit as sophisticated and innovative as their much celebrated contemporaries in continental Europe. 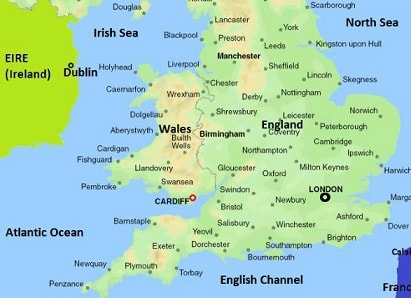 England completed its annexation of Wales in 1542. That annexation caused the replacement of the Celtic-traditional Welsh Laws with English laws. Wales began electing representatives to the English Parliament located in London. Despite centuries of aggressive attacks, Wales had maintained or revived its traditional dance and instrumental music. Contemporary performances of traditional Welsh music utilizes all of the expected Celtic instruments. However, Wales is most famous for singing and the harp. During the 20th century male voice choirs became very popular. This "tradition" was based upon a 19th century stereotype of nonconformist choral music. Singing in Wales has been a primary form of communications dating back to medieval times. Wales is noted for its lullabies and Christmas carols. Wales is only Celtic Nation with an unbroken tradition of harp music dating back to at least the 1100s CE. Wales is also recognized as greatest proponent of the triple harp. This harp has three rows of strings. Each string is separated by a half-tone. The triple harp was nearly replaced by the pedal harp used in orchestral ensembles. But, the triple harp made a significant comeback thanks to the revivalist work of folk musicians. A form of traditional music unique to Wales is the “penillion”. This is a performance art that employs a singer and harpist each performing different melodies but with the stressed syllables of the poem coinciding with the accented beats of the harp melody. Traditional music gatherings in Wales are identified based upon the style of music played. A “twmpmath” is a fok dance session. A “ gŵyl werin” is a folk festival. A “noson lawen” is a traditional music gathering more or less like the Céilidh of Ireland and Scotland. The Welsh tunes below are presented in both standard notation and ABC notation. Click on the audio players to hear the tunes. If you want to download an mp3 file of a tune to study it in greater depth, go to the tune download page. Performance examples of Welsh music are available at this link.